Do we need a (legal) definition of anti-Semitism? Drawing on the IHRA definition without the problematic examples, the new code of conduct adopted by the Labour party is a step in the right direction. 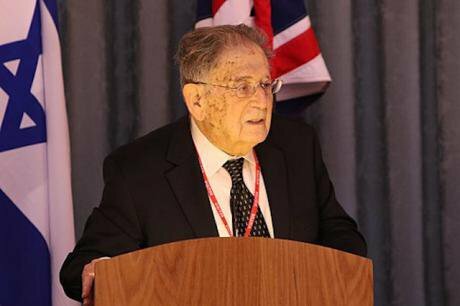 Professor Yehuda Bauer, Yad Vashem - The World Holocaust Remembrance Centre speaking at the Commemoration of Holocaust Memorial Day event at the FCO in London, 25 January 2017. Wikicommons/FCO. Some rights reserved. On 26 May 2016 the International Holocaust Remembrance Alliance (IHRA) adopted a controversial and problematic working definition on anti-Semitism. On 12 December 2016 it was reported that the IHRA working definition would be adopted by the UK government, so as to ‘ensure that culprits will not be able to get away with being antisemitic because the term is ill-defined, or because different organisations or bodies have different interpretations of it’. On 19 December 2016, the chief historian of Yad Vashem, Professor Dina Porat, endorsed the IHRA definition and its adoption by the UK government quoting David Hirsh’s statement, a sociologist of contemporary antisemitism at Goldsmiths, that ‘The new definition of antisemitism is only a threat to antisemites’. The debate regarding the IHRA working definition and particularly the examples for anti-Semitism it offers is ongoing, especially in light of last week’s decision of the National Executive Committee of the Labour party in the UK to approve a new code of conduct on anti-Semitism. Labour’s new code of conduct still draws on the IHRA working definition albeit without some of its controversial examples, especially those referring to criticism of the State of Israel. What, therefore, are the problems with the IHRA definition and examples of anti-Semitism? And, do we really need a specific legal definition of anti-Semitism? Drawing on my earlier critique of the IHRA definition I published in December 2016, I would argue that the attempt to legally define anti-Semitism and the specific examples the IHRA document offers are problematic as (1) they essentialise what they seek to dislodge, that is, the prefiguration of Jews as a homogeneous collective and the naturalisation of the figure of the Jew; (2) they strengthen the mounting racist-nationalist forces in Israel and Europe; and (3) they conflate anti-Semitism with anti-Zionism. First, focusing on anti-Semitism in an open society is an odd choice since the fight ought to be against racism in all shapes and forms rather than particular manifestations of hate/racism. Emphasising anti-Semitism might give the impression that there is a hierarchy of hatreds in which hate towards Jews supersedes all others. Are racist and violent acts towards BME in the UK and Europe, more broadly, less important?! There is no doubt room to define anti-Semitism and its uniqueness in historical, sociological and political analyses (see, for example, the work of Professor David Feldman). But defining anti-Semitism for legal purposes as a unique form of hatred is a dangerous path to take and may end up essentialising the figure of the Jew rather than dislodging it. Second, focusing on anti-Semitism and adopting the IHRA definition plays into the hands of racist-nationalist politics in the UK and Europe, which offer a distorted Judeo-Christian worldview vis-à-vis the Muslim/Arab world. We cannot ignore the contemporary European context – namely the ongoing economic crisis, anti-establishment sentiments and the rise of populist-nationalism – in which a pro-Zionist logic and the ongoing Israeli-Palestinian conflict are used to legitimate a xenophobic rhetoric against Muslims and immigrants. It is not surprising, therefore, that some of the most extreme nationalist and racist voices in European politics today are ardent supporters of Zionism and Netanyahu’s policies, thus, as Slavoj Žižek argued, creating an alliance between pro-Zionism and anti-Semitism (consider, for instance, Marine Le Pen and the rebranded Front National, the Austrian Freedom Party, or Geert Wilders and the Dutch PVV). Drawing on the IHRA definition without the problematic examples, the new code of conduct adopted by the Labour party is a step in the right direction. But are we not better off discarding the IHRA definition altogether, and fighting anti-Semitism by rejecting the racist discursive coordinates rather than adopting them? !